My only starting point for the 'Kinda' illustration was that I wanted Hindle on it, as he's the best part of the serial for me, a key 'villain' and rarely featured on others' covers. I did wonder if the last point was because there were few decent photos of the character, being aware myself of only a couple which I wasn't sure I could fit into my style of covers. But luckily, as often happens, the DVD's photo gallery offered up some good alternatives, plus many more useable shots of the Doctor than I'd been able to find elsewhere. Having found images of the Doctor and, to sit opposite him on the cover, Hindle, the question was was to put behind them. Unlike 'Snakedance', there weren't any other characters I especially wanted to feature, but figured I had to have a snake to represent the Mara. So I started looking around for photos of snakes and it was at this stage I began to formulate the idea of having a close-up of an eye (an iconic shot in the story as we enter Tegan's mind) but with the iris a snakeskin texture, which quickly became a full-on snake curling out of the eye -- if I could find suitable images and pull it off technically. Finding photos of snakes was one thing, but finding a suitable one coiled in a circle was trickier. Initially I tried taking a straight section and using Photoshop's polar coordinates function to turn it into a circle, but this distorted the scales too much and didn't look convincing. Eventually I found one that, while only slightly curved, I was able to warp a section of into a semi circle, which I could duplicate to form a full circle. I was undecided between having the head looking forward, as if coming out of the picture, or side on with jaws agape, but chose the latter as it menaced the Doctor nicely (mirroring my 'Snakedance' illustration) and had a more classic slit-shaped eye (the fangs I added). I was even able to find a photo of an eye that I thought was pretty similar to Janet Fielding's. The last element was using Dukkha as the glint in the eye. 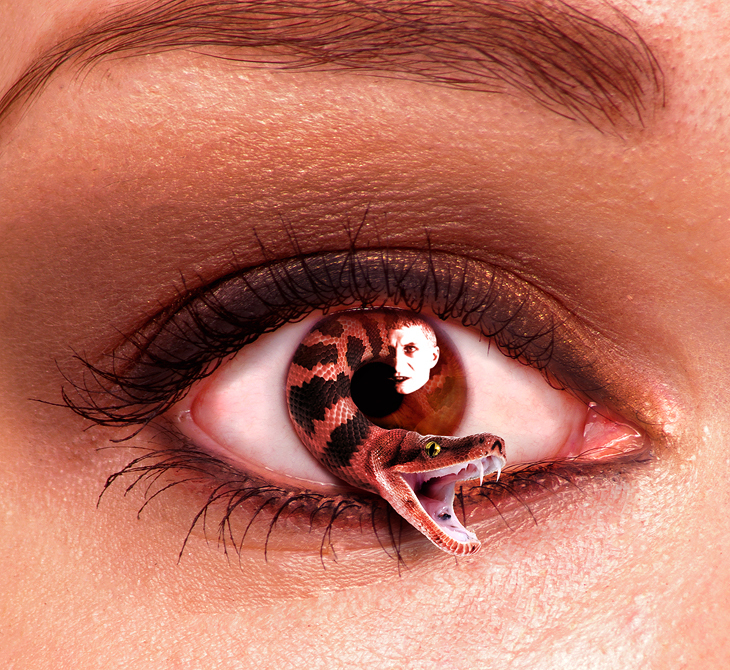 Here's the full composite of the snake-eye.